Unknown vintage; drank 8/13/15 @ Tap House Grill (Seattle). Small white head; strong lace. Mango, orange citrus, honey & apricot notes in the nose. Honey, mango & caramel flavors up front; dry booze notes on the finish. Balanced & enjoyable but a bit too dry. Hazy golden rose with two fingers of white ten minute head. Swirls of lace. Smell is dank pine some floral aspects as well. Taste is dank pine leather mint melon and peach. Plenty of malt backup. Mouthfeel is full with good carbonation. The finish is dry and bitter/sweet. Overall a huge beer. Well done Boneyard! A helpful bartender said "I got just the beer for you." When the glass arrived at the table its aroma caused my friend to ask what on earth I was drinking! 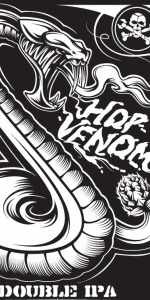 Hop Venom is a well formulated bitter burst, with a savory "malt backbone" that swept me off my feet. This is the beer that made me a snob. [Original rating 2013-06-14] Draft at Henry’s 12th St Tavern Portland OR. Pours cloudy gold / orange with thin white head. Aroma is citrus, straw grass, sweet malt. Taste is bitter hops with a sweet malt finish. Very solid DIPA. On tap at Blackback Pub in Waterbury, VT after a bruising 9-hour drive from southern PA. (I just offer that for context: sometimes things taste better after a long day; also, provenance [Waterbury, IMHO, being being the galactic epicenter of craft brewing] might make a difference). A nice clear amber with a fine-bubbled persistent off-white head. Initial impression was OMG: smooth, creamy fruitiness, with lots amd lots of citrus, a healthy dose of pine, some earthiness to keep it real, and a dose of caramel and biscuit malts to balance everything out. Mouthfeel is fluffy and smoooooth; carbonation is perfect. Finish is dry and a little bitter, but sweet too. If this sounds a bit over the top, it was intentional. This is beer number 926 for me and I ranked it second overall. Quite, quite impressive. Growler fill from Last Drop. Served in my LHBCo tulip. Coppery in color, and translucent, without much head formation. Really nice tropical fruit aroma: pineapple, guava. Flavor has an initial bite, but is very flavorful still. Delicious simcoe dominates. I get sweet orange peel complemented by a biscuity malt presence which provides more balance than I expected from a proud, aggressively named, PNW IPA. My second ale from Boneyard does not disappoint, though living up to Armored Fist is hard to imagine. Boneyard's website says 9% ABV and 60 IBU.